Heart Attacks and E-cigarettes: Are America’s Teens Putting Themselves At Risk? Many of the skeptical cardiologist’s patients managed to quit cigarette smoking by using e-cigarettes . They often continue to vape, prolonging their addiction to nicotine but overall I felt they were probably better off than smoking cigarettes. 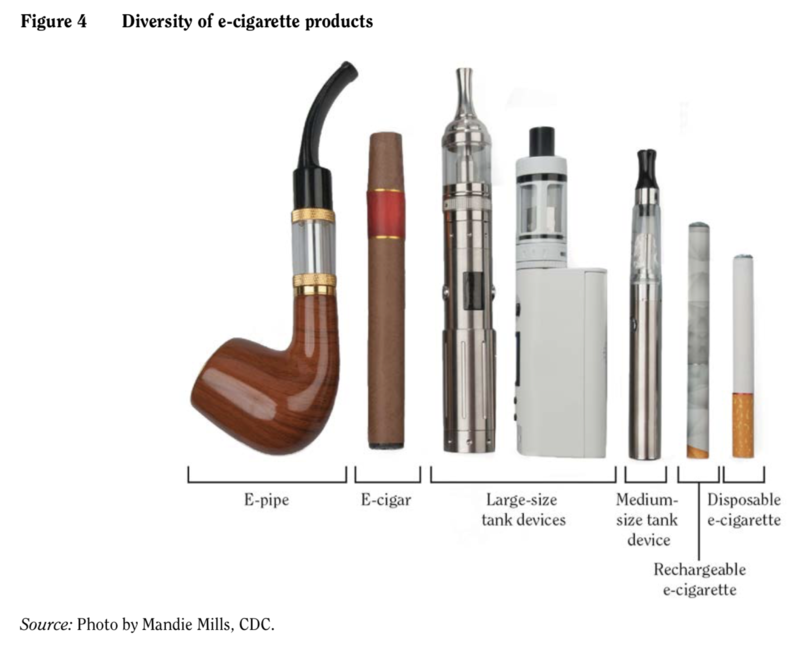 However, a couple of recent articles have me very concerned about the overall effect of e-cigarettes on public health. When adjusted for other risk factors, daily e-cigarette use was associated with significantly increased odds (Odds Ratio: 1.79) of having had a heart attack (myocardial infarction), as was daily conventional cigarette smoking (OR: 2.72). Former and occasional e-cigarette use were not associated with significant changes in the odds of having had a heart attack, while the same categories of cigarette smoking were associated with smaller increases in risk than for current smokers. “E-cigarettes are widely promoted as a smoking cessation aid, but for most people, they actually make it harder to quit smoking, so most people end up as so-called ‘dual users’ who keep smoking while using e-cigarettes,” said Glantz. “The new study shows that the risks compound. Someone who continues to smoke daily while using e-cigarettes daily has an increased risk of a heart attack by a factor of five. The second article was from The New Yorker and is fascinating. 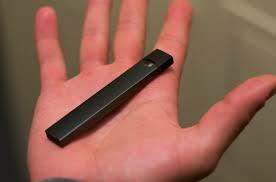 Entitled “The Promise of Vaping and the Rise of Juul.” , it details an alarming rise in teenage vaping which often involves a particular brand of e-cigarette, Juul, which resembles a flash drive. To Juul (the brand has become a verb) is to inhale nicotine free from the seductively disgusting accoutrements of a cigarette: the tar, the carbon monoxide, the garbage mouth, the smell. It’s an uncanny simulacrum of smoking. An analyst at Wells Fargo projects that this year the American vaporizer market will grow to five and a half billion dollars, an increase of more than twenty-five per cent from 2017. In the latest data, sixty per cent of that market belongs to Juul. Evidence suggests that while e-cigarettes are not without health risks, they are likely to be far less harmful than conventional cigarettes, the report says. They contain fewer numbers and lower levels of toxic substances than conventional cigarettes, and using e-cigarettes may help adults who smoke conventional cigarettes quit smoking. There is limited evidence that e-cigarettes increase biomarkers of oxidative stress, increase endothelial dysfunction and arterial stiffness. All of these factors are known to contribute to the development of atherosclerosis. Long term, it is anyone’s guess what the consequences of vaping on the cardiovascular system will be. 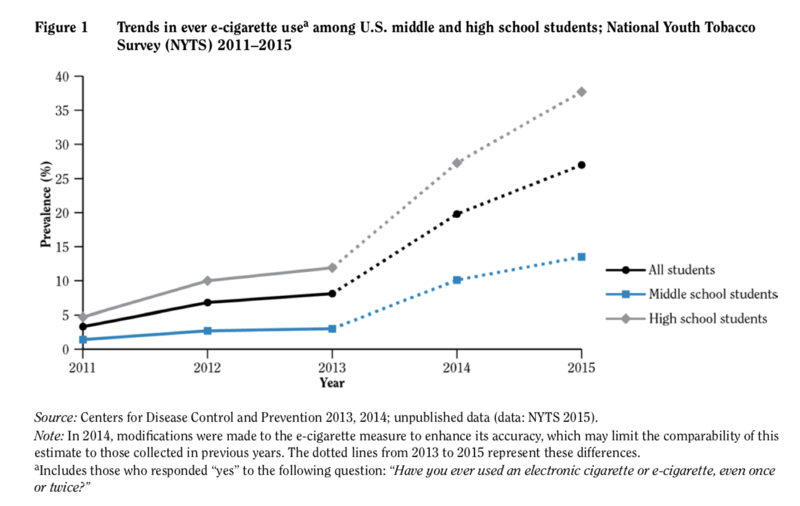 In 2015 there was a 40% chance your middle school or high school child had used e-cigarettes. The chart below from the CDC shows how rapidly rates are climbing. E-cigarette use among U.S. youth and young adults is now a major public health concern. E-cigarette use has increased considerably in recent years, growing an astounding 900% among high school students from 2011 to 2015. These products are now the most commonly used form of tobacco among youth in the United States, surpassing conventional tobacco products, including cigarettes, cigars, chewing tobacco, and hookahs. Most e-cigarettes contain nicotine, which can cause addiction and can harm the developing adolescent brain. Compared with older adults, the brain of youth and young adults is more vulnerable to the nega- tive consequences of nicotine exposure. The effects include addiction, priming for use of other addic- tive substances, reduced impulse control, deficits in attention and cognition, and mood disorders. Furthermore, fetal exposure to nicotine during pregnancy can result in multiple adverse consequences, including sudden infant death syndrome, altered corpus callosum, auditory processing deficits, effects on behaviors and obesity, and deficits in attention and cognition. Ingestion of e-cigarette liquids con- taining nicotine can also cause acute toxicity and possibly death if the contents of refill cartridges or bottles containing nicotine are consumed. Vaping devices no longer clearly look like cigarettes. Here are some examples from the CDC report. Note, however, that the Juul is not depicted. It doesn’t look like a cigarette or a device that would be facilitating your child’s addiction to nicotine. And it has a USB port so it can be recharged from a laptop. This wasn’t an issue as far as I can tell when my children were teens but I’m pretty sure if I had teenagers I would ban vaping and would confiscate anything that resembled an e-cigarette including flash or thumb drives that aren’t flash or thumb drives.